The National Zoo is right for you!!! 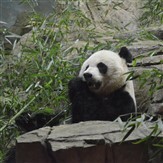 Visit the Washington D.C. National Zoo where you will see lions, tigers and the zoo's beloved pandas. Just some of the 2,000 animals on a 163-acre park they call home. All the animals are cared for by world-class zoologists and veterinarians. Meet the endangered giant pandas- Tian Tian and Mei Xiang and a male cub named Bei Bei!! You will find animals from all over the world in various exibits like the Elephant trails, Reptile Discovery Center, Cheetah Conservation Station and Amazonia.